I recently did a post on 'The Bilingual Child and Grammar' (see here), because I noticed grammar is gradually loosing it's grip as a result of bilingualism. So I was glad when my friend, Olutayo Irantiola, invited my family and some of our friends, to his quarterly cultural showpiece 'Yoruba Lakotun' at Ethnic Heritage Centre in Ikoyi, in September. It was a family outing for us in a way - my family saw it as an opportunity to unwind. But in another way, it was a means of embracing our 'slipping' culture again. And even better, we thought our child could start getting familiar with his culture (at an early age). We, as well as other guests, didn't regret honouring the invitation. 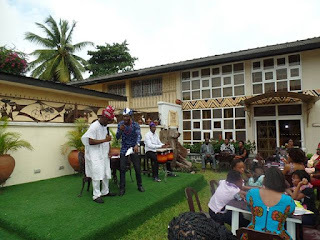 The programme was colourful and rich - there was the 'ewi' (chant) session, interview of a Yoruba scholar and writer, dance, entertainment, refreshment and more. It was so beautiful, and all for FREE. See video here. 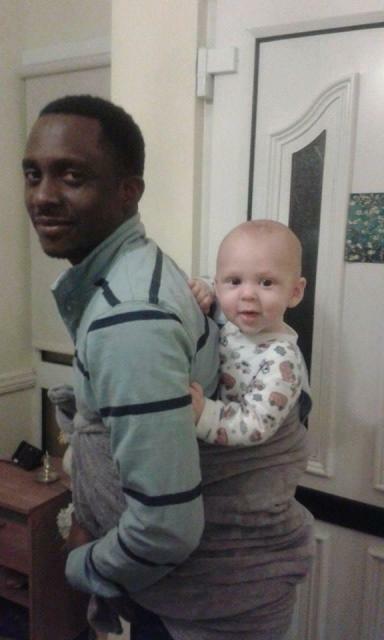 David Folowo is a Nigerian, married to an Irish woman, and together they have a son. But being married to a white woman, living in a white man's land, or learning the Irish culture will not make David forget his culture so easily. He loves the Nigerian way of life and would not hesitate to teach his wife how to be a Nigerian. No wonder David had his son backed as a way of teaching the wife how it's done in his part of the world (see picture). Now, that is a real man! Not many people (male and female) in interracial marriage are like David. They're either ashamed of their culture or their language isn't funky enough for learning. And as you've guessed, it will be stressful to put their other half through culinary lessons. Their dishes are either boring or impossible. How often do you have a heart to heart, real talk with your partner? When you're offended by your partner's action, do you bottle it up till you die of cancer or heart attack; do you tell it to someone who in turn tells it to someone who tells it to another someone till you become an object of ridicule; or do you genuinely discuss it with your partner without being judgmental? It's up to you to answer the questions. It's refreshing to see new artistes pop up, and Grace Adenekan is one of such. Popularly called Akorin, Grace is out with her debut gospel album and video tagged 'Bigger than the Biggest'. 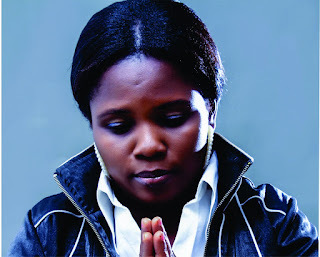 According to an official statement, Grace Adenekan has been a gospel artiste for many years. She started as a youngster in the church choir and has since followed her passion by proclaiming the gospel through music. Set for launch on the November 1, 2015 at the Centre for Management Development Hall, Magodo, Lagos, the album has 8 tracks, and has been produced in partnership with her husband, Kehinde Adenekan, who composed and co-arranged the songs with Segun Joshua. Akin Jazzy, featured in the track that the album is named after ‘Bigger than the Biggest’, and EMX mixed the track, ‘Sope’ and directed the video. Being bilingual is beautiful. I am bilingual, and have enjoyed its tremendous benefits. However, many bilingual speakers find themselves in the situation described above - attempting to describe something, or trying to translate a term or an expression into another language. Bilingualism is the ability to speak more than one language. One of its beauties is that it gives you an edge over monolingual speakers (people who speak fluently only in one language). According to Jeffery Nelson, if you are bilingual, people automatically think you’re a genius!